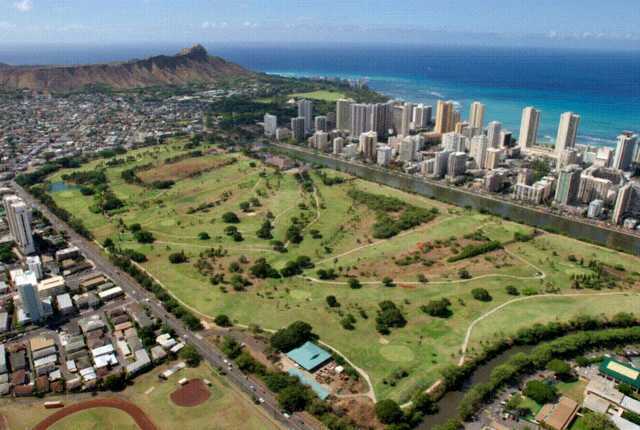 The 18-hole Ala Wai Golf Course in Honolulu, HI is a public golf course that opened in 1931. Designed by Donald MacKay, Ala Wai Golf Course measures 6208 yards from the longest tees and has a slope rating of 116 and a 67.2 USGA rating. The course features 3 sets of tees for different skill levels. Greens and fairways are bermuda grass. This course is typical muni .The course is totally flat within minutes of beach hotels I paid $75 for green fee plus cart. This is a$25 course The locals hate mainlanders and took 4 hours to play 14 holes. Fun. Flat. Fantastic. I started playing again and this was a great golf course to test my abilities. Now I'm playing regularly because there's nothing like the fresh scent of grass mixed in with trade winds, friendly golf enthusiasts and warm Hawaii weather. And no other golf course offers you a full view of Diamond Head from one of the holes! Grateful to live in Hawaii. Keeping active. Four star for being so close to our hotel in waikiki. Played it on a glorious day with three locals. Simple, friendly layout with a view of the city (just like in Manila), the hills and the diamondhead, reasonably price, with a driving range nearby. Being able to play it makes up for the three-hour wait for tee time. They do a good job maintaining one of the world's busiest courses. I heard nothing of the course from the hotels we stayed in, and only found out from seeing players walking from across the ala wai canal and referral by the cab driver.